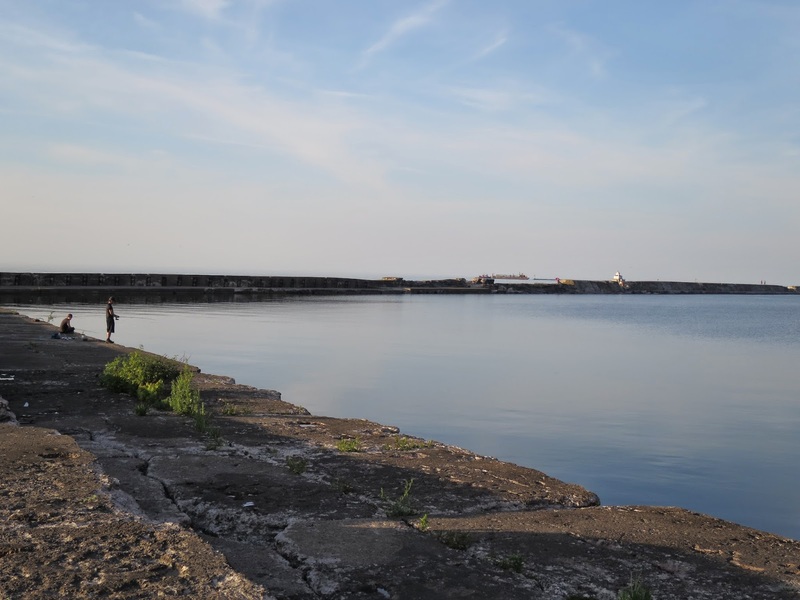 Oswego, the first port city on the Great Lakes, has three breakwaters protecting its harbor. Replaced and updated over the years, most recently in the 1930s, these concrete structures have been pounded for four generations by the elements. The outer west breakwater, the longest of the barriers, bears the brunt of the abuse. Its decaying concrete, punctuated by huge holes punched through it by waves and ice, stands in silent testimony to how violent Lake Ontario can get when the wind hits her the wrong way. The only one of the breakwaters accessible to foot traffic, it stretches for roughly 2,000 yards, from the steam station (the two massive smokestacks on the city’s west side) all the way to the lighthouse, a fabulous structure listed on the National Register of Historic Places. 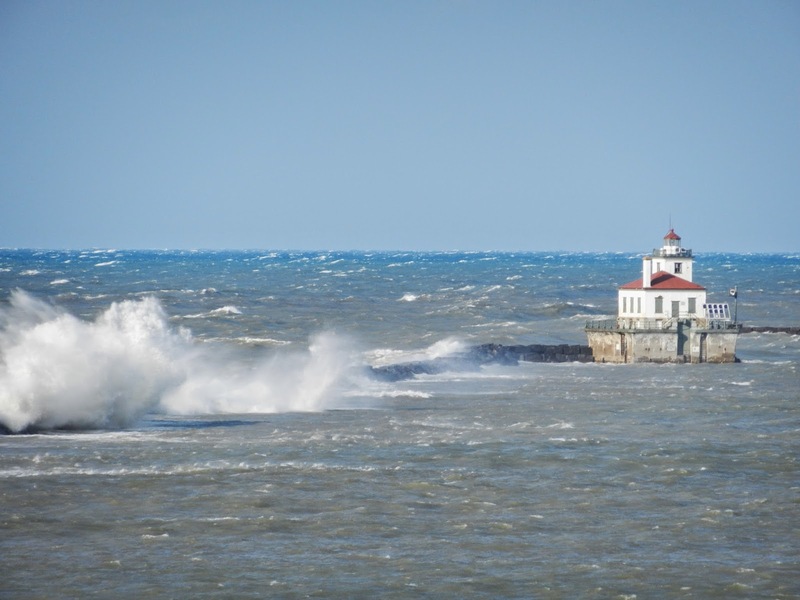 The city of Oswego owns the lighthouse and the Coast Guard operates it. And while the authorities would rather folks stayed off the structure leading out to it, a motley crew of individuals ranging from sightseers and lighthouse buffs to extreme joggers and anglers use the wall as an adventurous route to recreational satisfaction. There’s really nothing preventing folks from venturing out on the breakwater. Signs posted on the path at the corner of the parking lot at the end of 6th Avenue warn of the hazards slippery and windy conditions pose. But you’re allowed to decide whether you want to risk going out there or not. From autumn through spring, that’s a no brainer: conditions are generally so extreme, frigid whitecaps slam into the wall. If you’re walking on top of it you’ll probably get hypothermia in less than 100 yards, or, even worse, washed into the drink. And if you think you can beat the wind by walking the apron skirting the bottom of the barrier’s south edge, think again; even on mildly windy days Lake “O’s” waves grow high enough to wash over the top, soaking anyone down below. Come summer, however, warm temperatures and a wealth of panfish translate into a fishing adventure gung-ho anglers can‘t resist. Most are creatures of comfort and never venture more than a couple hundred feet beyond the breakwater’s source. They don’t have to. 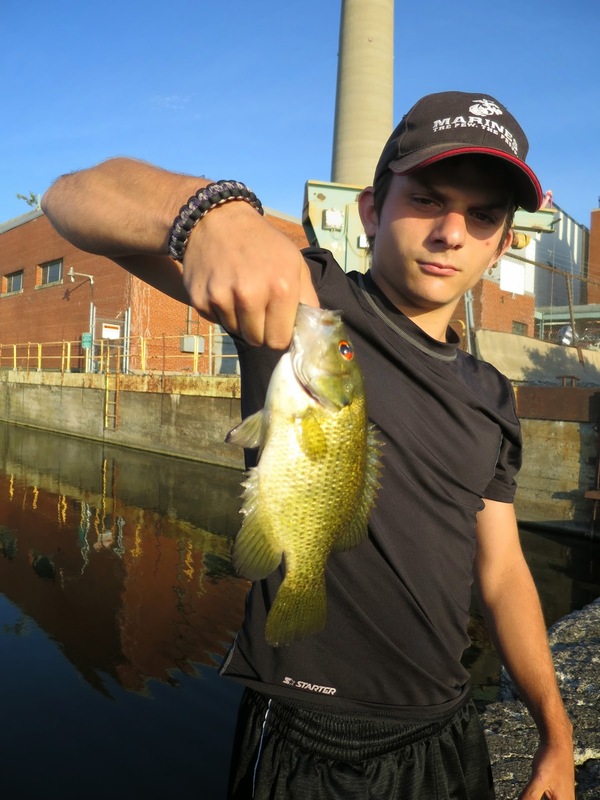 “Lake perch entering the harbor from the west follow the wall,” says Oswego’s Rob Copeland. And this invariably brings them, likeminded lake smallmouths, even an occasional salmon, brown or steelhead right into the corner where the steam plant and breakwater meet. Rock bass can always be counted on to come to the rescue, however. Spring sees massive quantities of the critters averaging about a pound swarm into the Oswego River. Indeed, the fishing is so magical in May, it’s become the stuff of legend. One of the most productive spots is the small section of wall jutting due north from the western edge of the powerhouse, just before it banks to the right. Worms, minnows, crayfish and small lures all produce a lot of the feisty googleyes. But even this close to shore, there’s always the chance a rogue wave can roar over the wall and sweep you into the drink. It’s a good idea to wear a flotation device whenever you’re recreating anywhere near the breakwaters…especially if you venture out a ways. 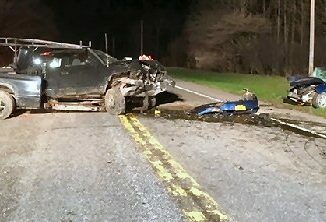 Be safe, fish longer! If you don’t mind struggling with brush, the shipping channel’s south bank, directly below Breitbeck Park is immune to unexpected wave action and offers the best northern pike and largemouth bass fishing in the city of Oswego. The channel hasn’t been dredged since tankers stopped delivering fuel oil to the steam station some 50 years ago, and a massive weed bed develops each summer. These alpha predators grow big on the cornucopia thriving in the thick vegetation. The bass take spinnerbaits, YUM Dingers, wide-bodied crankbaits and swimbaits. The northerns respond to all the above except the stickworms, and also like buzzbaits and bucktail jigs. Dark colors like green pumpkin work best when the water’s murky; bright colors work best when it’s clear. Lake Ontario’s waves easily pouring over the top of the Outer West Breakwater.